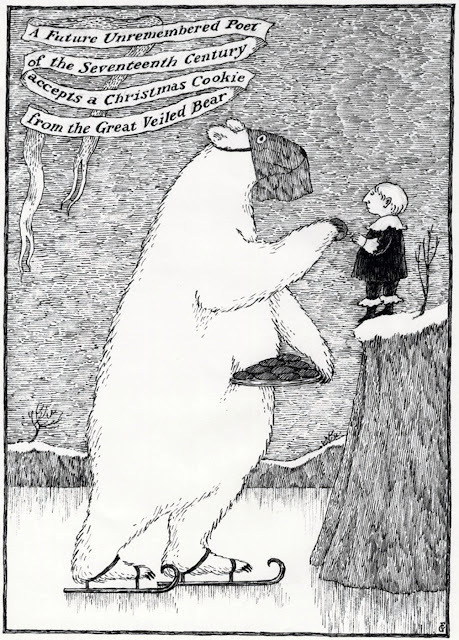 I’d accept a Christmas cookie from the Great Veiled Bear. Here’s to Ogdred Weary, Mrs. Regera Dowdy, Eduard Blutig, Raddory Gewe, Dogear Wryde, E. G. Deadworry, D. Awdrey-Gore, Wardore Edgy, Madame Groeda Weyrd, and Miss Hyacinthe Phypps. That, by the way, is my favorite Christmas card in the world.